Norman Regional Moore, 700 S. Telephone Rd. Health Information Technology: Friend or Foe? IT Security and Industry Trends Telemedicine in the hospital Using Telemedicine in rural health care EVENT REGISTRATION: If you are employed by an OHA member hospital, you can register online and pay by credit card. Please visit www.okoha.com/educationcalendar and click on the meeting title. 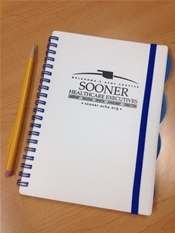 If you need to set up a login, please contact Shelly Bush at bush@okoha.com or (405) 427-9537. The Oklahoma Hospital Association is authorized to award three hours of ACHE Face-to-Face Education continuing education credits. ***There is an additional registration fee to attend this session at the OHA Convention. Whitewater Center, 800 Riversport Dr.
Join us for a member networking opportunity, The purpose of this evening event is to network and have a good time, and to provide an opportunity for member appreciation. The event is free to ACHE members. Oklahoma Hall of Fame at the Gaylord-Pickens Museum, 1400 Classen Dr.
Join the SHEs and the OU ACHE Chapter to spend time together serving others. Arrive as early as 3:30 p.m. to help set up, but feel free to join us anytime until a little after 6:00 p.m. Register to serve at: https://ache-service-activity.eventbrite.com Email Whitney Dockrey Miller at whitney.j.dockrey@ou.edu with questions. Connect with the ACHE Career Services website to "Find Your Job" or "Fill a Position"
Whether you are a healthcare leader working in a hospital, health system, clinic, university, or other organization, membership in ACHE gives you the opportunity to: 1) be among leaders in healthcare management, 2) grow professionally and excel in your job, 3) enjoy greater satisfaction and career potential, 4) contribute and give back to your profession, and 5) become an automatic member of Sooner Healthcare Executives (SHE).